The average physician joins the workforce with an overwhelming $183,000 in debt, nearly five times the average amount of money other professions have been shown to owe. That is if they’re not also dealing with debt from undergraduate studies, usually averaging around $24,000. With interest, this adds up to roughly $2,000 a month on a standard 10-year plan. The struggle is real. Fiscal goals can be set. Plans can be enacted. Careers can flourish. It may take some time, but med-school debt can be properly tamed and financially planned out with the right steps and research. Unbeknownst to some, there are insightful and economical answers to strengthen overall med-school financial planning. Not all doctors can (or wish to) meet the standard proposed by federal lenders: equal monthly payments for ten years. That’s a short time writing big checks. Don’t worry; you have a few alternative repayment plans facilitated by the government to choose from as well. These are categorized as basic or income-based repayment plans (IBR). 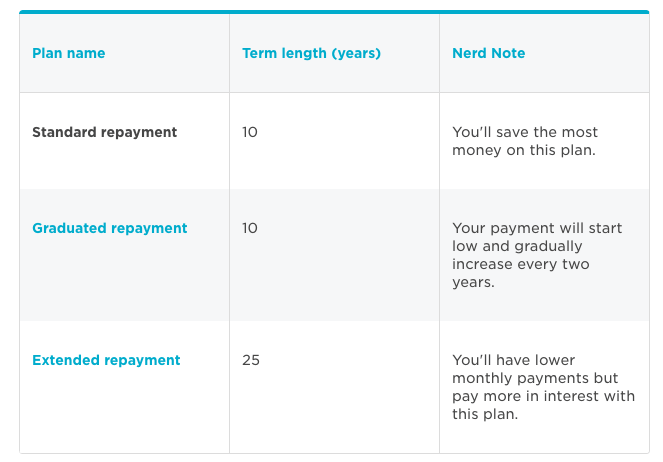 A basic repayment plan features a standard, graduated or extended repayment plan—although the last one will generate more interest over time, as explained in this chart by Nerdwallet. Instead of a basic 10-year plan, family physicians can also switch to an IBR to lessen their monthly dollar amount through an increment of payments, reaching up to 25 years. Payments are established as a percentage of your income (10-15%) that funnels back into your loans. A popular feature is loan forgiveness, which exonerates your remaining loan balance at the end of the term. To check your eligibility, you can visit the Federal Student Aid. However, this feature forgives but doesn’t forget, meaning that you will have to pay taxes on the amount exempted. Lastly, as mentioned above, extending your term requires that you pay more in interest than if you stick with the 10-year standard plan. 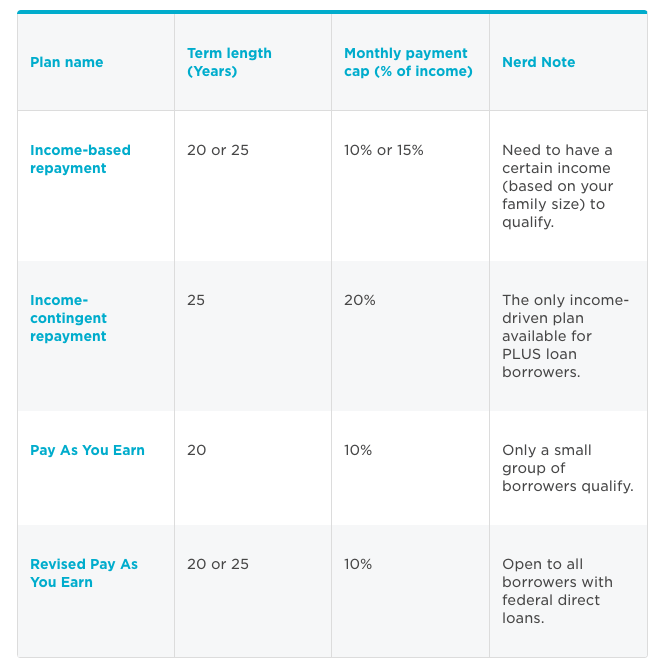 If you are still unsure of which plan serves you best, we encourage you to use this repayment estimator, a government tool that issues a comparison of what your payments would look like under each plan. It will ask for your income, outstanding loan balance and interest rate. Private lenders continue to make a good case as the go-to solution to pay off student debt, with some able to knock down a good five points from your current loan. So, let’s assume your current income and credit history qualify to grant you approval from a private lender. This will help you adjust your repayment schedule and take advantage of a lower interest rate. Nevertheless, it’s important to remember that by signing the dotted line again you will deny yourself access to your federal repayment plan and all that comes with it, including loan forgiveness for doctors. Curious about refinancing? See who are the 6 Best Banks to Refinance and Consolidate Student Loans in 2017. Doctors signing up for volunteer work never expect a financial reward, but that doesn’t mean it doesn’t exist in some form. Take those enlisted in The Peace Corps. While helping people in need, family physicians can also garner upwards of $30,000 through the organization. The program called Global Health Service Partnership lends itself to the aid of doctors to promote global health conditions while also cutting down their medical school debt. Volunteering in such roles coincides with the hands-on work family physicians are already accustomed to, making the transition from professional to volunteer work simple. A multitude of Peace Corps programs exist and offer different plans set to different periods of time (usually 1-4 years), depending on how much debt volunteers wish to reduce. It’s important to play detective when engaging in the workforce. Good hospitals can be found all around, yet you want to find the hidden gems offering signing bonuses, for example. A simple conversation with a physician recruiter could reel in dozens of great options nationwide. Modern Medical Network finds that signing bonuses are becoming more commonplace for doctors, with offers up to $25,000-$250,000. The importance here lies within reading the fine print on the contract. A bonus should be a bonus and not a further advancement on your loan. By leaning on a signing bonus, a large chunk of debt can be paid off. Another opportunity lies in the fact that more and more hospitals in rural America are starting to pay off student loans, as a way to sweeten up the deal for family physicians who would preferably go to metropolitan areas, as we mentioned in our article, Largest Expenses Physicians are Facing. Checking with HR at your hospital may offer some solutions. The Society for Human Resource Management states that roughly 3% of employers provide loan repayments, a number that continues to grow. Overcoming medical school debt may seem overwhelming at first, but no matter your financial situation, taking the time to look into planning will always aid in the quest to decimate your debt. Resources lie just within reach. Read, research, and discover new options. Saving money will always be worth the time. So tell us, on a scale from 1 to 10, how comfortable are you making your monthly payments? What method are you currently using to cover your debt?